Perceived in a vacuum, H&M's eco-luxe "Conscious Exclusive" collection—the Dr. Jekyll to its primary line's cheap-chic Mr. Hyde—is everything a clothing brand should aspire to be. Replete with garments mindfully constructed from better-for-the-planet materials such as organic cotton, recycled polyester, organic silk, recycled wool, hemp, and Tencel, the Swedish retailer's annual foray into aspirational fashion is leagues away from its typical strategy of planned obsolescence. 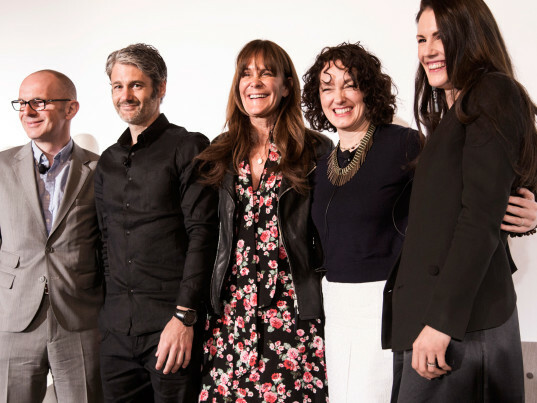 To hear Anna Gedda, H&M's head of sustainability, tell it, however, Conscious allows the company to test new ideas that eventually filter into its discount threads, which Gedda says benefit from its research into water- and energy-saving technologies. Organic, recycled and so-called "Better Cotton," for instance, now account for 31 percent of H&M's total cotton use. (H&M is one of the world's biggest users of certified organic cotton.) 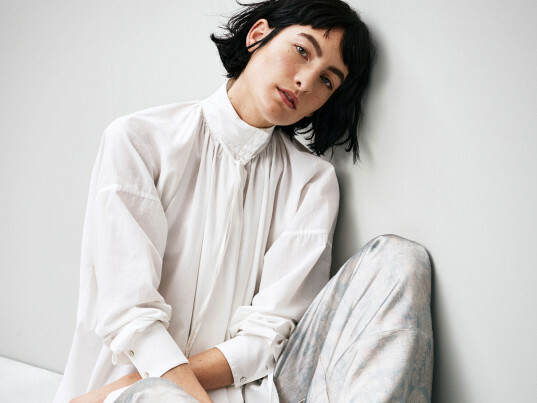 Together with Better Cotton, Gedda says H&M's use of sustainably sourced materials has grown from 11 percent in 2013 to 20 percent in 2016—not too shabby when you consider the firm's scale. Of course, Gedda is telling us all this in Paris, capital of fashion and l’amour. At a gilded, frieze-adorned ballroom at the Westin, where H&M is hosting members of the press on its considerable dime, the byways of Bangladesh and Cambodia couldn’t be further away. As the world’s second-largest apparel company—after Inditex, which owns Zara—H&M’s financial wherewithal is considerable. But so then is its clout, whether it’s used for good or ill.
Or is it the ethical enterprise that seeks to bolster consumer interest in issues such as textile waste, while advocating for living wages and funding innovations that could bring us closer to a closed-loop economy? There are no easy answers, and Gedda, for one, welcomes the questions. 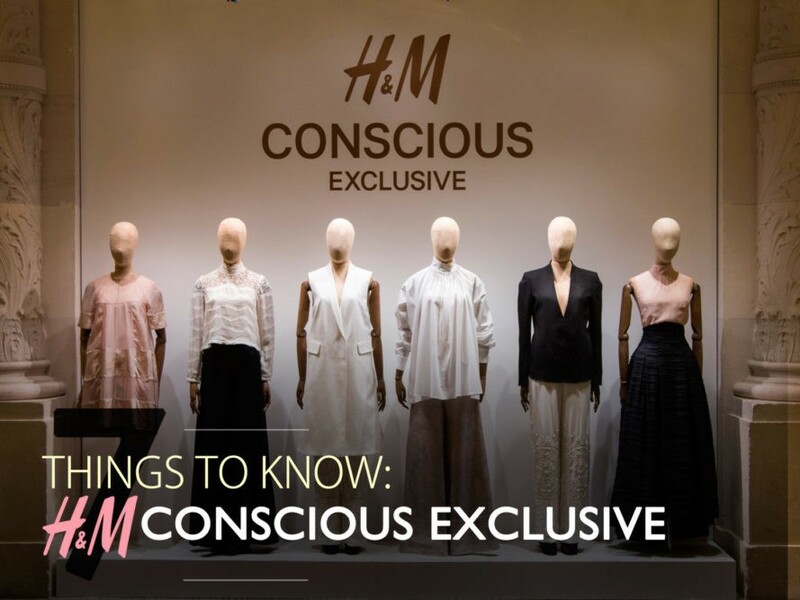 As for this year’s Conscious Exclusive collection, which drops in about 180 stores worldwide and online at www.hm.com from April 7, here’s what we know. This year’s Conscious Exclusive line is H&M’s fifth. Launched in 2012 as a red-carpet-ready complement to the retailer’s more-accessible “green” collection, then a year old, it promises to “show that high-end fashion can be sustainable,” Gedda said. 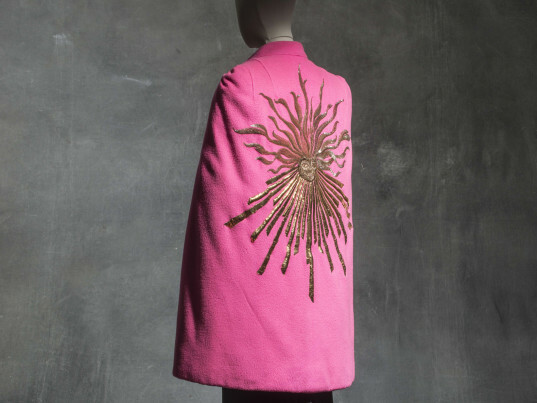 H&M is timing its Conscious Exclusive with the April 7 unveiling of Fashion Forward: 300 Years of Fashion, an exhibit that celebrates the 30th anniversary of the Muse?e des Arts De?coratifs’ fashion collection. H&M is the show’s exclusive sponsor. 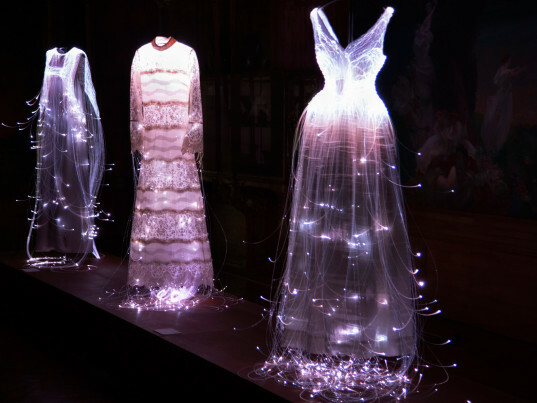 The exhibit, which takes place in Paris’s Palais du Louvre, will include past H&M looks, such as the retailer’s 2004 collaboration with Karl Lagerfeld of Chanel. H&M says that the work of artists such as Gustave Moreau, gleaned from Muse?e des Arts De?coratifs’ historic archives, served as inspirational linchpins for the Conscious Exclusive collection. Some references are more literal than others. One dress renders Botticelli’s Three Graces in digital print; another offers a wedge of Caravaggio La Primavera. The museum’s numerous Art Nouveau and Art Déco pieces provided the scaffolding for some of the collection’s subtler designs, from the intricate curlicues of one particularly sumptuous jacquard jacket, made of recycled polyester and silk, to the chunky rhinestone abstractions of an organic-silk column gown. This season’s Conscious Exclusive launch features three eco-friendly wedding dresses, each a standout with beaded embroidery or rhinestones made of recycled glass. The bridalwear starts at about $213. Julia Restoin Roitfeld, the “face” of this year’s campaign, is a Parisian art director, model, and style icon. She’s also the daughter of former Vogue Paris editor-in-chief Carine Roitfeld, lately of the critically lauded CR Fashion Book. 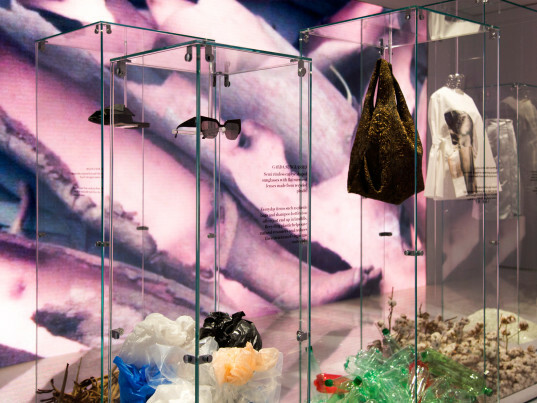 In an echo of Lagerfeld’s lament in January that “there are no sequins in wood,” many of the materials H&M employed had to be created from scratch. One such highlight are the aforementioned recycled rhinestones, which were derived from glass-factory waste. Also worth mentioning: a bow-topped slipper crafted from organic leather and Tencel (the latter is reconstituted from eucalyptus fibers), a sheath gown stitched from a silky hemp (“grows fast without the use of pesticides or fertilizers and requires less water,” says H&M), and a pair of cat-eye sunglasses with flat mirrored lenses made of recycled plastic bottles. Meant for use in countertops and building, Denimite takes the form of Art Déco–esque earrings in this year’s Conscious Exclusive collection—a fashion first. This year's Conscious Exclusive collection drops in about 180 stores worldwide and online at www.hm.com from April 7. Here's what we know about it. This year's Conscious Exclusive line is H&M's fifth. Launched in 2012 as a red-carpet-ready complement to the retailer's more-accessible "green" collection, then a year old, it promises to "show that high-end fashion can be sustainable," Gedda said. "Many things we thought were impossible are happening today," she said, referring to the technological barriers that once impeded innovations in sustainability. "What we think is impossible today will be possible tomorrow." With innovation playing a key role, Gedda says that H&M's goal is not to "make fashion sustainable but sustainability fashionable." H&M is timing its Conscious Exclusive with the April 7 unveiling of Fashion Forward: 300 Years of Fashion, an exhibit that celebrates the 30th anniversary of the Muse?e des Arts De?coratifs' fashion collection. H&M is the show's exclusive sponsor. H&M says that the work of artists such as Gustave Moreau, gleaned from Muse?e des Arts De?coratifs' historic archives, served as inspirational linchpins for the Conscious Exclusive collection. Some references are more literal than others. One dress renders Botticelli's Three Graces in digital print; another offers a wedge of Caravaggio La Primavera. The museum's numerous Art Nouveau and Art Déco pieces provided the scaffolding for some of the collection's subtler designs, from the intricate curlicues of one particularly sumptuous jacquard jacket, made of recycled polyester and silk, to the chunky rhinestone abstractions of an organic-silk column gown. This season's Conscious Exclusive launch features three eco-friendly wedding dresses, each a standout with beaded embroidery or rhinestones made of recycled glass. The bridalwear starts at about $213. "We wanted our wedding dresses to be special: sustainable with a sense of the now," said Ann-Sofie Johansson, creative advisor at H&M. "It's about love: a celebration of all that is good in the world." 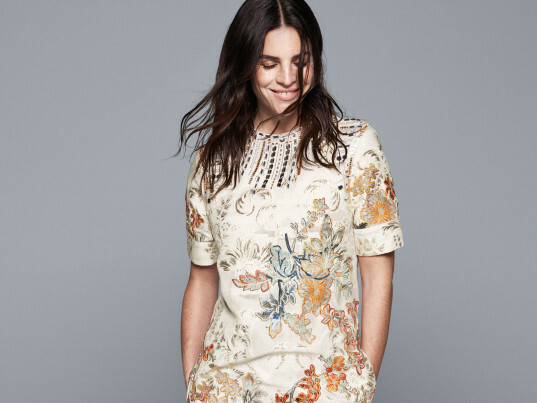 Julia Restoin Roitfeld, the "face" of this year's campaign, is a Parisian art director, model, and style icon. She's also the daughter of former Vogue Paris editor-in-chief Carine Roitfeld, lately of the critically lauded CR Fashion Book. In an echo of Lagerfeld's lament in January that "there are no sequins in wood," many of the materials H&M employed had to be created from scratch. One such highlight are the aforementioned recycled rhinestones, which were derived from glass-factory waste. Also worth mentioning: a bow-topped slipper crafted from organic leather and Tencel (the latter is reconstituted from eucalyptus fibers), a sheath gown stitched from a silky hemp ("grows fast without the use of pesticides or fertilizers and requires less water," says H&M), and a pair of cat-eye sunglasses with flat mirrored lenses made of recycled plastic bottles. What's Denimite? In a 2013 Kickstarter campaign, Iris Industries, the material's Lincoln, Neb.–based creator, says Denimite is "made of recycled denim scraps combined with a partial bio-based thermoset resin binder under high pressure and heat and resembles a sodalite gemstone." 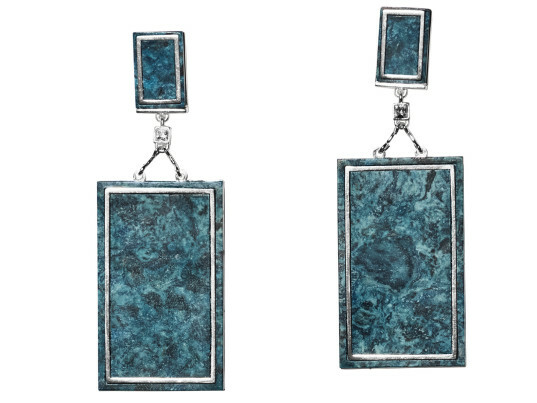 Meant for use in countertops and building, Denimite takes the form of Art Déco–esque earrings in this year's Conscious Exclusive collection—a fashion first.